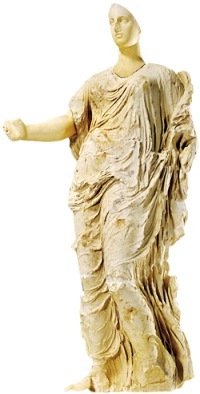 The 5th century BC Greek statue known as the goddess of Morgantina, was unearthed in illegal excavations in Sicily, and after being smuggled into Switzerland and eventually given “legal” status, it was purchased in 1988 by the J. Paul Getty Museum in Los Angeles for $18 million. Recognized by archeologists as having come from the ancient site of Morgantina, after a thorough investigation and long negotiations the Getty museum eventually agreed to return the disputed statue to Italy in May of 2011. Amongst much rejoicing and fanfare, the looted goddess is now housed in the archeology museum in Aidone, a small town set on a lofty hilltop near the ancient city of Morgantina. 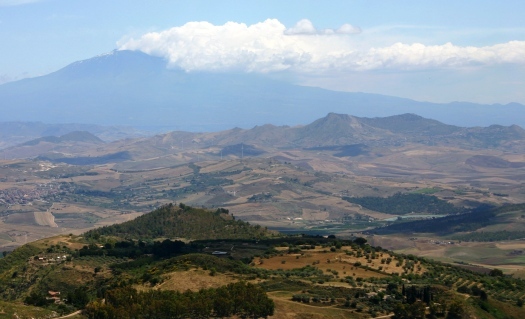 Sicily’s hilly terrain coupled with an antiquated road system means getting to Aidone and Morgantina is a long trek from just about anywhere, but one fine June day we decided to see what all the fuss was about. Much of our route from Modica to Aidone was on winding back roads with little traffic, and also without much in the way of road signs, but we managed to find the town with only a couple of U-turns. Before arriving at the museum, we noted an information point with a couple of tour buses, and stopped for further info. A friendly man gave us a map of the town, and with obvious pride, pointed out the route to the archeology museum, and also suggested we visit a church and the belvedere with a splendid view. We are instructed to leave our car and continue on foot, but Emanuele, ever the hardheaded Italian, insists on driving, and after getting lost, we soon end up on a steep narrow street barely wide enough for our compact car. After wedging the car into a stairwell, we clamber out and hurry to rush past the tour group arriving on foot. Inside the splendid statue is a bit of a surprise. At 2.20 meters tall (7 ½ ft) this a big goddess, with massive thighs outlined beneath her flowing gown, and I am at first a bit disappointed as she seems to lack a certain elegance. It’s as if the size of the room does not quite do justice to this amazing figure – she needs more space. But the more I gaze upon her, walking around to get a good look from all sides, I begin to sense her power and feel that she just might burst through her gown, crushing the onlookers in one triumphant step. The Goddess of Morgantina (often erroneously referred to as Venus) is most likely a figure of Persephone and is carved using the acrolithic technique in which a different material is use for the body and the extremities. In this case the body is carved from a limestone from Ragusa, while the head and extremities are carved from Greek marble. Traces of color suggest that the gown was once painted. Archeologists date it from 400-425 BC, and a likeness of the statue has been found on ancient coins from Morgantina. It is surmised that the statue originally stood on a pedestal in the center of the ancient city of Morgantina. Locals hope that the return of the Goddess of Morgantina will help the economically depressed town of Aidone, and I hope that they are right. Join us on a private tour tour in Sicily to see this and many other amazing sites. 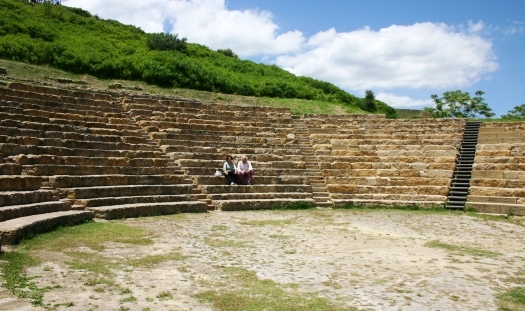 Hi Anita, we have visited Morgantina and Aidone, fascinating and in the middle of nowhere….wondering if you know how the rocks with sea shells ended up in Morgantina? Hi Susanna, Glad to have found your site! I am coming to the area you mentioned to see that amazing statue. I am a ceramic sculptor and am very interested to see Persephone and other sculptures in Sicily. Any recommendations or favorite places to stay in the general area would be greatly appreciated. I will be arriving after Easter in April and have a car.